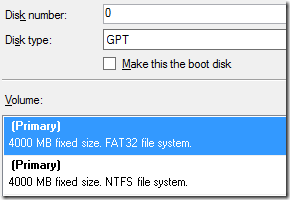 If you are using Bitlocker, Configuration Manager 1610 or higher and get a piece of hardware that has TPM 2.0 there are a few more hurdles to get the device encrypted. Coretech has written notes from the field which states the two options going forward. Following their recommendation – lets go down the path of running a device with CSM (UEFI) enabled and installing Windows 7. 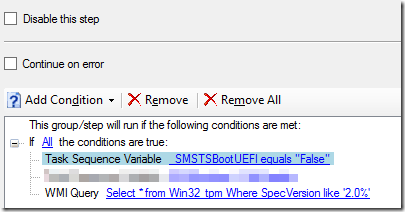 Make sure that the device is running in UEFI and is setup as expected. 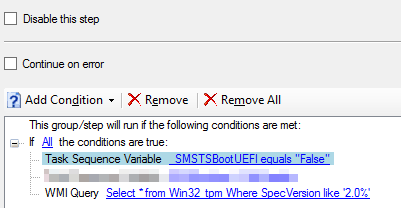 I will leave the actual configuration of BIOS / UEFI out of this – as any device with TPM 2.0 will most likely have a preconfigured settings that are optimal. If not, time to configure for UEFI (without Secure Boot). Once that is completed – create a new group that has the intention to identify if we (if possible) booted with a legacy option (legacy PXE-boot, legacy USB stick etc etc). Validate that its not UEFI-booted and that we have a TPM 2.0 chip (and add a check that we are also intending to install Windows 7 x64).